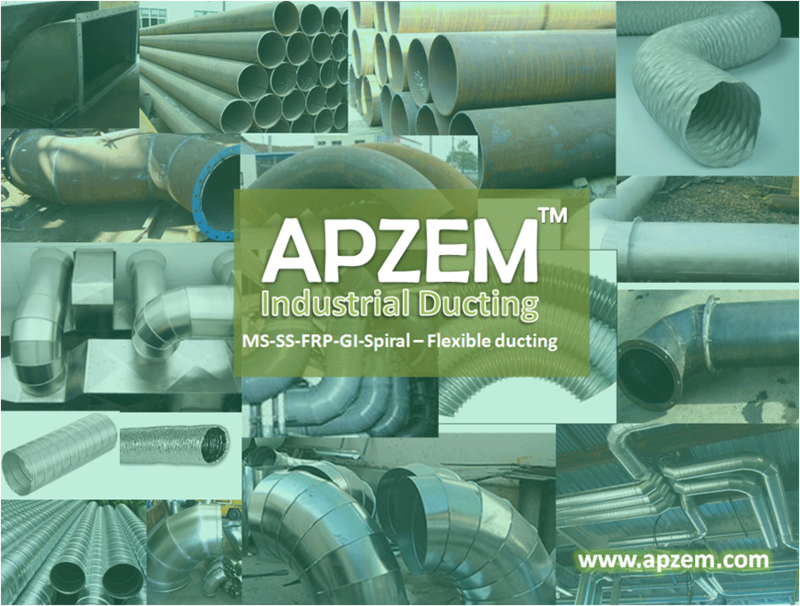 Flexible ducts & Ducting | Apzem, India. Flexible ducts are made of different materials and are very much finds its usage in applications requiring more flexibility, and affordable. Many of flexible ducts are made of Polyurethane, PVC, Fiberglas with Teflon coated. Most of flexible hoses are made of plastic and are chemically inert and having high corrosion resistance, high wear resistance and compressibility. Flexible ducts can be used along with other ducts like M.S ducts, GI ducts, SS ducts & FRP ducts wherever flexibility is required. And also in corrosive environment like acid fume transportation in electroplating applications etc. where metals will not withstand. Other than our list of FRP products, we also undertake complete turnkey projects involving designing, manufacturing, erectioning and commissioning of FRP Hoods, ducting, scrubbers, Blower and chimney arrangement and servicing of existing FRP products. Whatever corrosive nature it would be , please feel free to contact us and we are always happy to assist you from designing to commissioning.